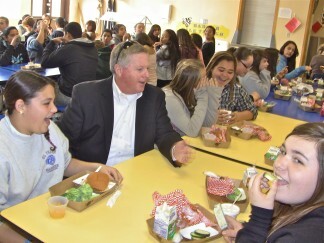 New ETUSD Superintendent Rodney Wallace visits El Tejon School during lunch hour and sits next to Kayla Perry at the 'healthy table' as Perry contemplates her serving of broccoli. Rodney Wallace is a relaxed man with a quiet sense of humor and a clear set of priorities. 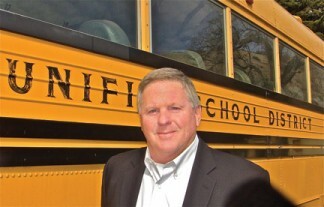 The new El Tejon Unified School District superintendent likes to be with students and he likes joking about his profession with members of the ETUSD staff. “My wife says I grew up with a ‘Leave It to Beaver’ life,” he smiles, telling about his childhood in Wasco, where he began kindergarten and graduated from high school. His dad was the auto shop teacher and counselor at Wasco High School. “We could go everywhere on our bicycles,” in the summers as kids, “and no one ever worried as long as we showed up at home for lunch and dinner,” he recalls. Wallace gives the impression that he knows what matters. He lost his older brother to a brain tumor, he says, as he tells about the value of family and his appreciation for the closeness of small town life. Then he turns to the challenges of ETUSD. my own kids,” he said in an interview last week. Wallace says he is determined to grow enrollment in the district, and to do that by showing that there is a new culture of excellence in the schools. 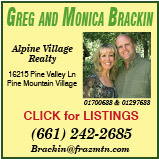 The night before, at the monthly meeting of the board of trustees February 6, ETUSD’s three principals stood in turn to summarize the core subject proficiency levels of students at Frazier Park School, El Tejon School and Frazier Mountain High School, according to the state’s standardized testing. Each principal outlined action plans in their school’s new Single Plan for Student Achievement (SPSA) to raise the proficiency levels in core subjects. El Tejon School Principal Jimenez and right, El Tejon Teachers Association President Chuck Mullen agree on the challenge. No one who is paying attention can think it will be a snap, but a strong team has been assembled to turn the area’s largest school district around to rebuild confidence. On February 6, El Tejon School Principal Rosalie Jimenez delivered stark facts to ETUSD Trustees about Math and English proficiency scores at the middle school, telling how the actions listed in the Single Plan for Student Achievement (SPSA) will raise academic performance. 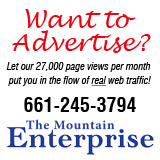 You can have your newspaper delivered via mail! 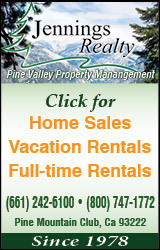 Just call 661-245-3794. 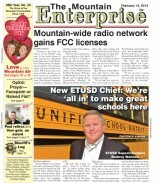 Also, this story and others are available right now at newsstands throughout the Mountain Communities. 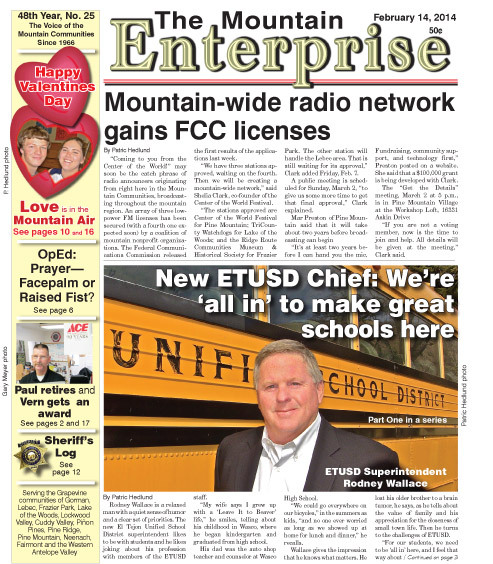 This is part of the February 14, 2014 online edition of The Mountain Enterprise.